Experience life in a native American community or in the verdant “hollers” of Appalachia. Unique and meaningful community service opportunities await you within the borders of the United States! As a volunteer in the USA, you work one-on-one with local people on education, labor, childcare and cultural projects for a week of service, learning and fun. In the mountain shadows of the Rockies or Appalachians, you contribute your time and skills, and enter a world unknown to tourists – acquainting you deeply with the spirit of these soulful communities. Live and learn like a “local” in one of our USA community service programs: Volunteer in Appalachia – West Virginia. Volunteer on the Blackfeet Reservation in Montana. Service program fees are tax-deductible for U.S. taxpayers when you follow our itinerary. Select program options below to see upcoming service program dates for The USA. Then select a program date to hold your place on a team with your $350 deposit. Call a volunteer coordinator at (800) 487-1074 for help if needed. If you prefer, you may print a text application and submit it by mail or fax. Minors – under age 18 – must complete a minor application and travel with a parent or adult legal guardian. Your team leader is a Global Volunteers alumni or member of staff who has completed our comprehensive team leader training, and is skilled in leading diverse groups of people. All of our team leaders are certified in CPR, and have served on multiple service programs – some up to 20 times! Further, they’re evaluated by the volunteers on each program, and must achieve an established level of performance in order to continue leading Global Volunteers teams. You’ll receive background information on your team leader approximately four weeks before your service program begins. Global Volunteers’ service program officially begins with the Saturday evening meal. If you are delayed, please contact us with your updated arrival plans. Many volunteers drive to the host community either from home or the airport. Your volunteer orientation materials will provide updated information on your team meeting place in the host community. Arrive at the Great Falls International airport (airport code GTF) any time before 3 pm on the Saturday your program starts. You may depart after 12 pm (noon) on the Saturday your program ends. There is no public transportation from Great Falls to the Blackfeet Reservation. Summer days on the plains of Montana can get hot. Sunburn and dehydration can be risks, so we urge you to pack sunscreen, a wide-brimmed hat and a water bottle. You likely will not encounter wild animals or poisonous insects or snakes at the work sites or at lodging facilities. However, stray dogs may be present. We strongly recommend you consult your own physician, public health clinic and/or travel clinic for detailed travel health information, and make sure your tetanus shots are up to date. Ample time is provided after the work day to enjoy local natural and culture attractions – which include museum visits, souvenir shopping, hiking local trails, swimming, golfing, casino gaming, and participating in community events and celebrations. Volunteer often attend traditional Indian “sweats,” sun dances, pow-wows and rodeos. As a Global Volunteer, you have the unique opportunity to experience the reservation as a “non-tourist” and participate in daily activities with local residents. 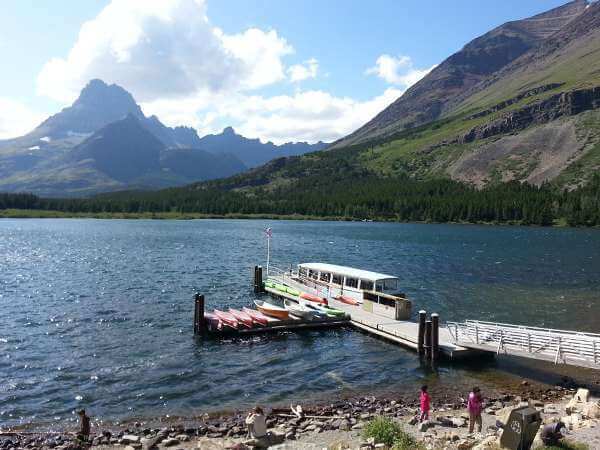 While our non-profit status prevents us from organizing free-time activities, tours of Glacier National Park can be arranged for days before or after the service program. In addition, car rental agencies are located close by in East Glacier. Serving on the reservation is a most unique and fulfilling family opportunity. Children as young as 8 can fully participate in work projects, team meetings and free time. Most non-Indians in the U.S. never have the opportunity to experience “rez life” personally. As Global Volunteers, you and your children are acquainted with the cultural differences and similarities between Native Americans and Non-Indians, and gain respect for those living within the limitations of economic poverty. Stereotypes are dispelled, assumptions are challenged. You’re exposed to the Blackfeet language, traditions and legacy of the early American settlers in Indian territory. Each day, you provide a needed service – be it supervising and entertaining children, serving reduced-cost meals to senior residents, painting or refurbishing community buildings, or visiting with elders in the Blackfeet care center. Together with your teammates, you explore what it’s like to live in wide-open spaces, practice customs passed down through generations, attend to the natural rhythms of earth, wind and sky, and listen to the wisdom of the Great Spirit. Service programs are conveniently scheduled during summer break from school. Parents and guardians are expected to supervise their child volunteers, and collaborate with our team leader and local partners to maximize the service experience for everyone. In this way, youth form a rare, personal perspective of this unique culture beyond textbook depictions and legends. What’s more, they may gain life-long friends in one of the country’s least-understood populations. Many student and corporate groups have served on our USA programs to learn first-hand about the host community and to strengthen their commitment to community service and teamwork. Because of the wide variety of volunteer projects, every member of your group can fully engage their unique skills and interests in meaningful service. We work with you to customize your program to learn about each other in a non-traditional way as an intact volunteer team. With advanced preparation, you can be certain that your unique contributions on genuine development projects advance the futures of those you serve. For instance, members of a worldwide healthcare consulting company united on the reservation for a week of collegiality and service. Employees who knew of each other only through the company directory planted gardens, painted fences and rode horseback together. A residential program for high school students select team members each summer to serve and learn with the Blackfeet people and to gain self-esteem through teamwork. Other student groups return year after year to learn about Blackfeet history, language, culture and modern life in a decidedly “non-tourist” manner. Working with local teens, tribal leaders, elders and children, you gain a rare, “insider” perspective of daily life on the reservation. Comparing notes with your teammates at the end of the day around the campfire, you reflect on the experience of volunteering together and experiencing the Indian culture as you live it. We’ve responded to community needs throughout the USA since 1999. We currently focus our efforts on areas of extreme poverty – such as West Virginia’s Fayette County and the Blackfeet Nation in Montana. Isolated from the general public in sparsely populated states, these two communities are not well-known. The poverty observed by visitors, however, is far from the complete story. Working with grateful people as a volunteer in the USA for just one week, you learn about their unique culture and history – while providing significant community service to children and elders. Review a standard USA volunteer schedule here. Labor projects are plentiful: You might help plant a community garden one day, move office furniture the next, paint a classroom, and then wrap up your week helping to erect a Sun Dance lodge in Montana. In West Virginia, you might help rehabilitate dilapidated and energy inefficient homes for elders or low income families in economically devastated rural coalfield communities. This is a high-energy assignment! Help supervise field trips, play and direct games, read story books, or teach a lesson on a topic of your choice. Do you enjoy bingo, poker, swapping stories or nail polishing? Assist the activities director at the elder care center with stimulating projects and visit one-on-one with Blackfeet elders. Or, help prepare, serve and deliver meals at the assisted living center on the reservation. Lend your compassion and reassurance to children and teens who are in protective custody during a family crisis. You help provide a serene environment with stories, movies and games, and assist with meal preparation and clean up. When no children are in residence, volunteers with social work, nutrition, first aid, psychology and related expertise can help train the employees – most of whom have no specialized or professional training. Sometimes you can help teens and adults learn the basics and improve their computer literacy so they can successfully compete in college and in job-seeking. In West Virginia, you might help students study for their GED tests so they can enter the world of work. On some programs, you can use your professional skills to present workshops, in office assistance, or for specific requests such as substance abuse treatment and recovery. You might help purge and organize files, provide internet research assistance, advise on diabetes prevention and fitness, or teach young entrepreneurs basic marketing and business principles. Your health and safety as a volunteer in the USA are our top priorities. Lodging is dormitory style in community facilities, with large rooms and shared bathrooms divided by gender. Smaller private rooms may be available for families with young children if requested in advance. Breakfast is self-serve at the lodging facility, with packed or provided lunch at the work sites. Evening meals are prepared by a local cook at the lodging facility. Food is typical American fare – meat, potatoes, salads and soups. Strict vegetarian and other restrictive diets may not be easily accommodated. Local water is safe; bottled water is available. Through important, full-day volunteer assignments and free-time activities, you learn about the Blackfeet Nation and the significant ways you improve children’s and elders’ lives. Our time-tested and proven philosophy of service ensures your efforts help advance the host community’s development vision and goals. You contribute to genuine development projects, and in doing so, you’re accepted as family. Our commitment to work in partnership on long-term community projects enables you, in just a short time, to serve as a critical link in a chain of volunteer support spanning three decades. Read more about our Montana program though the prospective of our volunteers below or on our program blog.